In a surprise double victory, Condé Nast Traveler US readers have voted St Lucia’s Ladera not only the “Best Hotel in the Caribbean,” but gave it the highest score of any hotel in the world, ranking it the “Best of the Best” in the overall hotel category. The honor marks the first time in the 18-year history of the awards that a Caribbean hotel has appeared on the “Best of the Best” list. The awards featured in the November issue of Condé Nast Traveler, that went on newsstands from October 25. When an intimate, 25-room, open-air hotel overlooking the St Lucian rainforest and Caribbean Sea is rated the number one property in the world, it is a confirmation that the current trend toward life changing travel experiences, and not just quick getaways, is here to stay, says the resort’s management. Ladera opened in 1992. 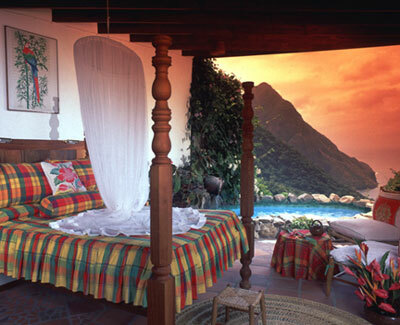 It is uniquely situated on a ridge at 1,100 feet overlooking the volcanic Pitons, the Caribbean Sea and the Soufrière valley. Ladera is known for its distinctive eco-lodge architecture, built with Caribbean timber and modeled on luxury tree-house living and a relaxed, barefoot lifestyle. Guestrooms were intentionally built without a fourth wall, yet were designed to be both sheltered and completely private. The design affords spectacular sunset views and unobstructed star gazing at night. Dasheene, Ladera’s restaurant, is noted throughout the Caribbean for its innovative kitchen and creative renderings of island cuisine. Unlike many island resort restaurants, Dasheene’s menu is based on native ingredients and relies on the local bounty for its fresh, innovative take on West Indian dishes. Wow ... sounds like a wonderful place to stay however, from my limited knowledge of hotels in the Caribbean I am surprised the "Sandy Lane" in Barbados didn't get first prize ?? I was expecting it to be Sandy Lane as well. Ladera looks breath taking. I must make it there someday. My small island mek it! I was always told St. lucia was beautiful in every way. Bup Bup to St. Lucia, my NEIGHBOR to the NORTH. I'm not surprised, I hear St Lucia is a beautiful country. Congrats!!! St Lucia is very pretty...If I can't make it to the Grenadines next month...St Lucia is my next choice. I went last in 2001, hopefully I make it there in the near future. Shandy: It is...you should visit one day. it is definately on my "must go to" list.